Retailers can survive in the 21st century by being "lifestyle navigators" and providing an experience not possible online, says Culture Convenience Club (CCC) CEO Muneaki Masuda. Under pressure from e-commerce and video streaming services, bricks-and-mortar movie rental shops and bookstores have been closing everywhere. But Japan's largest bookseller is not only thriving, it's eyeing an expansion into China. 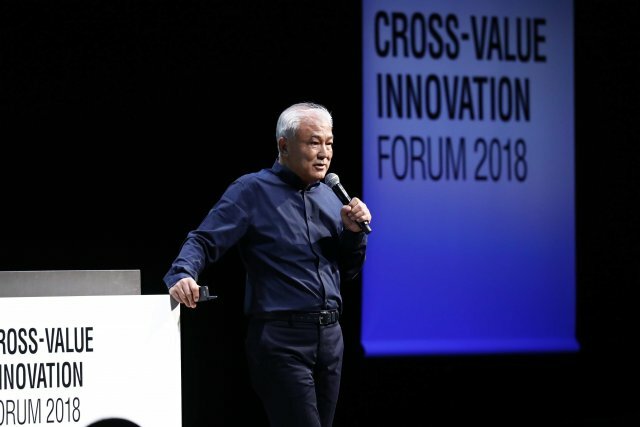 "Our concept is not to sell books but to offer lifestyle navigation," Muneaki Masuda, Representative Director and CEO of Culture Convenience Club (CCC), said in a presentation at Panasonic's Cross-Value Innovation Forum 2018. "Our revenue is increasing despite the fact that other bookstores are underperforming and closing down." Masuda was referring to one of CCC's many retail outlets: DAIKANYAMA TSUTAYA BOOKS, an upscale retail complex in Tokyo, offering everything from books and movies to music and Starbucks coffee. Part of the group's TSUTAYA chain of book and DVD shops, DAIKANYAMA TSUTAYA BOOKS, opened in 2011 and was named one of the 20 most beautiful bookshops in the world by culture website Flavorwire. By offering consumers new experiences such as cooking classes, antique fairs and even fountain pen workshops, retail spaces can enrich customers' lives, Masuda told attendees in a special lecture at the forum in Tokyo, which marks 100 years since the founding of Panasonic. "We want to provide shops where you can pursue your own lifestyle," Masuda said. Tokyo-based CCC's history is nothing short of remarkable. It was founded in 1983 with the opening of TSUTAYA BOOKS, a small shop in Hirakata, Osaka Prefecture. It has since grown into a nationwide chain of book and movie rental shops under the banner of TSUTAYA, a wholly owned subsidiary. Its flagship store, opened in 1999 in Tokyo's Shibuya, rents out millions of DVDs annually and outsells all other stores in Japan in terms of books and magazines, according to the company. But CCC, which posted 276 billion yen ($2.4 billion) in net sales as of March 31, 2018, now describes itself as a "culture infrastructure company" working in "lifestyle navigation." It started to shift away from DVD rentals by launching a video streaming service called TSUTAYA TV in 2013; impressively revenue from book sales was 130.8 billion yen ($1.1 billion) in 2016, up 35% from 2010, according to Nikkei Asian Review. Meanwhile, the retail organization is leveraging data from both its inventory - it has over 120 million stock keeping units including more than 1 million books - and customer data accumulated from its T Card, a loyalty program introduced in 2003. There are now nearly 68 million active monthly T Card users in Japan and the card is accepted at thousands of shops nationwide, from gas stations to pharmacies. "By applying artificial intelligence to this gigantic volume of data, we can create contents that are useful for our customers," Masuda said. In recent years, CCC has launched TSUTAYA in Taiwan, planned for a push into China and diversified its domestic lineup even further. TSUTAYA Electrics in Tokyo's Futako-Tamagawa neighborhood, for instance, sells upscale home appliances, toys and plants in addition to books and magazines. At T-KIDS in Chiba Prefecture, children can learn subjects such as English conversation, martial arts, technology and how to make videos for YouTube. CCC has also turned heads with its bold designs and promotion of art. It has built a series of hybrid bookshop-libraries in regional cities such as Takeo, a city of 50,000 in Saga Prefecture, where it won a Japanese Good Design Gold Award in 2013. New library is set to open in Wakayama Prefecture. CCC has also branched out into publishing art books. Its GINZA TSUTAYA BOOKS in downtown Tokyo's Ginza 6 shopping complex features an event space and original art works on display - ranging from contemporary sculpture to handcrafted Japanese swords - as well as 60,000 art books from around the world including oversized collector's editions. In his presentation, Masuda contrasted this approach, in which customers can have unique experiences depending on which outlet they visit, to Amazon's huge inventory and sales volume. "As opposed to storage space for inventory, we need to have contents for lifestyles," Masuda said. "Rather than going to a gigantic bookstore, people come to us to discover something new...Art has the capability to offer this kind of discovery." Although the company's name is often abbreviated as CCC, Masuda said he believes four Cs are must-have future-proof attributes for retailers and workers in the culture space: creativity, critical thinking, communication, and collaboration. But he summed up his philosophy with an epigraph from Zen Buddhism: Issai yui shinzou, or "The heart creates everything." "Humans used to create things with their hands, but with the Industrial Revolution and capitalism, people used their brains to increase gross domestic product," Masuda said in his concluding remarks. "But going forward, we need to use our heart to create goods and services. This is the meaning of a rich society." Mr. Muneaki Masuda, Representative Director and CEO of Culture Convenience Club Co., Ltd.